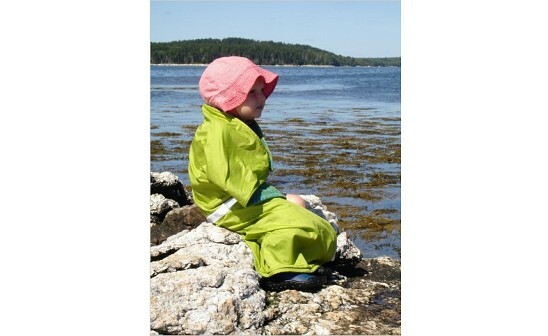 The Bunnytail Blanket, invented by a mom of twins and made in Maine, is a multipurpose, indoor-outdoor wonder. Yes, it’s just a simple rectangular blanket, but it has windproof, water-resistant nylon on one side, warm Polarfleece on the other. It also has sturdy reflective tape sewn down the center (making it a natural to pop onto the jogging stroller) and a handy snap joining two of the top corners (so older tots can sport it as a superhero cape). It’s tough enough to work as a small picnic blanket or ground cover (the nylon side), yet it’s gentle enough to snuggle up to a baby’s delicate skin (the fleece side). And when a mom finds something like this, she can finally clean out that overstuffed blanket drawer/shelf/bin/trunk and recycle the ones that never made the cut–simplifying her life, and doing something good in the process. (We gave our old blankets to our local animal shelter.) Now we can all sleep easy. Thanks Bunnytail Blanket! I hope you enjoyed my story today. Every word is true. My little one loves this. She rubbed the silky nylon side against her face, and also seemed to enjoy chewing on the Polarfleece! So it kind of kept her occupied while keeping her warm on our walk. I'd love to hear your comments and find out what blankets have worked for you, whether you somehow wound up with way too many blankets (like us), and what else you'd like to know about this blanket. You'll see that we leave the Bunnytail Blanket product up for a few days...until we are ready to start our 24 hour product cycle. You can really buy it if you like, of course. We are so excited to be at this point. Thanks for visiting! Jessica...you will always be very special to us as our very first person to post a comment on our site....THANKS...we just went live. Quietly. You can see my post on that below. I love it, love it, love it! I'm poking around and so far, everything seems in order! I'm beyond the need of a stroller blanket but will be back often to check out what else is in store! Shannan, thanks for showing up and for the words of encouragement. They mean a lot. Congratulations all on your fabulous site. I just love the blanket. Never have I seen a baby blanket so perfect for the active parent! The reflective stripe just tops the cake. Looking forward to my daily dose of the Daily Grommet!! Lula - Thanks for visiting, we hope you found this a nice discovery spot... come back often. I am trying to buy 2 blankets but the buy button has been disabled. Help??? Yeah...we know. Sorry. Eric, our software developer was here straight from Sunday to Wednesday and he is getting some much-needed sleep. I know he will jump on that as soon as he is vertical. Rick--So nice to see you here. We have to get Joy up and going on posting by Monday (which is our "real" Bunnytail day... And yes...need help testing everything so we are bulletproof by Monday. I will take all the help you can offer. Katherine - Thank you for being a friend of Daily Grommet! ...and you know a thing or two about Polarfleece! Katherine is an expert on this subject because she worked at Malden Mills the inventor of Polarfleece. Very good initial effort. I particularly like the Inventory Status. The website seems to work well and it is a fun site. I wish you all the best with your business. Congratulations on getting it officially started. Jules and I met Joy Pratt years ago when we all worked together at Stride Rite. Joy is the type you want to hate.....too tall, too beautiful, too capable and too thin! We love her though, in spite of all her perfectness because she's also brave! Our first Grommet....the Bunnytail. Thanks, Joy! congrats on the site. Looks fab. I too am beyond strollers, however will check back often. Hey, is that Joanne DM by any chance? Jeannette--it is indeed! We are having a blast working together. Hey--try out subscribing to our daily emails and let me know if they show up well on your computer. Start next week. Nice to hear from you! I noticed that your comment got cut off on our site...don't take it personally....we just need to fix a little bug there. The folks at Bunnytail call it "tropical punch," but I would call it orange and bright pink, and it's a really cool color combo. I wanted to mention this because I notice that the color in the picture above is just a little more washed-out than it really appears. I've always loved orange. It's in my daughter's nursery as an accent color, and apparently it's really hot this year in celebrity baby rooms. Thanks for pointing that out Emily....the blanket was hard to capture in photography. Both the colors but also the scale. And most especially, I think the photo makes it look stiffer and heavier than it is in real life. It really is soft and lightweight. I think you can kinda appreciate that better in the video. This is so exciting! 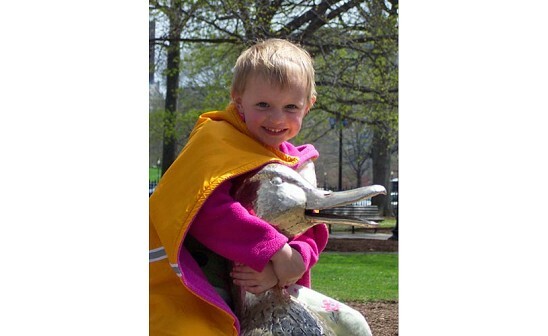 Great to see Daily Grommet up and running :) The bunnytail blanket looks great. It's funny how we found Bunnytail Blankets. Joanne was cruising around LinkedIn, figuring it out for the first time. She saw that Joy was on it--LinkedIn told her about that because they worked at the same company. Just to be friendly (and out of curiousity) Joanne checked up on Joy and lo and behold we knew we had found our first Grommet product. So we spent the last five days with the site up but doing lots of tweaking. As of today, we will start really operating by changing the product every weekday at noon. We popped the champagne about an hour ago. Our software dude Eric was up all night (again) so we might have the random sleepless-at-3AM-created bug or two. Please let us know if anything is awry and we will fix it right up. And please tell us what you think--in general. We are learning so fast, thanks to people chipping in with advice and observations. Hello grommet ladies, want know how to play the video on my blackberry? Jules, you are right we are learning so much from all the great comments we are getting. The [email protected] is working just great and new ideas are starting to come in. Thanks to all our fans. What a great product to start with. It really is bunny tail soft. I was thinking about how handy that reflective strip is now that it is dark by 5 pm. Well it is for me too! Actually, it's not as scary as getting in front of a video camera but that's another post. Many of us are learning how to converse in this forum....the rule that I am following is: be yourself, be honest and try to be helpful. Thanks for stopping by. Thanks for commenting. And come back tomorrow. Well, yes, it is kinda new and scary to lots of us! I have many friends who email constantly, but who are unsure about commenting on a post. It's fun, it's easy -- and it can be so helpful (like Emily's scoop about using this wonderful blanket with a Bjorn). I am a friend of Joy's from Newport, RI. I bought one of Joy's Bunnytail Blankets for a friend of mine. My friend sent me a sweet note saying how much she loves the blanket, especially that it is both warm and repels water. Kind of like a cuddly windbreaker in cool colors. 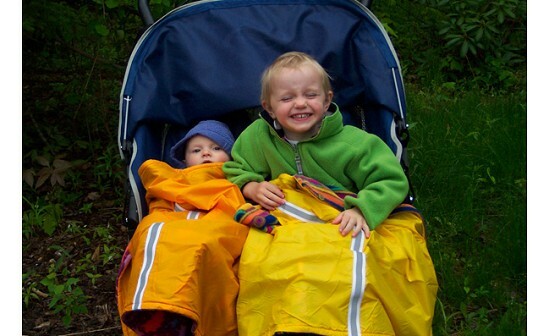 The Bunnytail Blanket, invented by a mom of twins and made in Maine, is a multipurpose, indoor-outdoor wonder. Yes, it’s just a simple rectangular blanket, but it has windproof, water-resistant nylon on one side, warm Polarfleece on the other. It also has sturdy reflective tape sewn down the center (making it a natural to pop onto the jogging stroller) and a handy snap joining two of the top corners (so older tots can sport it as a superhero cape). It’s tough enough to work as a small picnic blanket or ground cover (the nylon side), yet it’s gentle enough to snuggle up to a baby’s delicate skin (the fleece side).